The cast of The Crucible. Photo Credit: Trudie Lee. Widely considered a modern classic, Arthur Miller’s The Crucible is at once a compelling drama about the Salem witch trials and a striking allegory of McCarthyism, a practice born from the second Red Scare. To think, however, that Miller’s play is a relic of the Cold War era would be naive considering the politics of fear that govern us still today. First produced in 1953, The Crucible stages the mass hysteria that consumed the town of Salem, Massachusetts between the years 1692 and 1693. In Miller’s semi-fictionalized account of events, the town is taken by accusations of witchcraft after Reverend Samuel Parris’ daughter Betty (Kevin Corey and Caitlynne Medrek, respectively) is struck by a mysterious, seemingly incurable illness. Rumours begin to circulate between the townspeople that Betty’s illness is the work of witchcraft. Samuel reveals that he caught Betty and other young girls, including Abigail Williams (Claire Armstrong), from the town dancing in the forest around a fire with his slave Tituba (Lennette Randall). Fearing punishment for trying to conjure magic, specifically a death spell against Elizabeth Proctor (Vanessa Sabourin), Abigail deflects any accusations against her by accusing Tituba of being a witch. Soon, a witch hunt is underway as Abigail and the other girls begin falsely naming other witches living among them. Abigail’s lie turns to something even more dangerous when she tries to win back John Proctor (Karl H. Sine), a farmer whom she had an affair with while his wife was ill. To be with John, despite him rejecting her, Abigail accuses Elizabeth of witchcraft, and it is an accusation that John fights hard against in order to save his wife from hanging. Modern audiences may find the idea of witches laughable, certainly this audience does, but the belief in witches was very strong at the time. And the belief was largely reinforced by inexplicable behaviour, which we would recognize today as neurological disorders, displayed by the accused. Awash in the unknown, the people of Salem grasped at any explanation to provide them comfort in the face of an invisible threat. Understanding this play within a modern context, there has been no greater, incomprehensible threat in the last 15 years than the threat of terrorism. No greater period of uncertainty than the days, months, and even years that followed the attacks on September 11th. Suddenly, in the public’s mind, there were terrorists everywhere. And sadly, to great harm, members of the American public identified potential terrorists as any who fit a specific ethnic or religious background. The threat was out there, and the public needed to project their fear and panic somewhere. The very same fear and panic would justify increasing the government’s surveillance powers e.g. The Patriot Act. Given recent anti-terror legislation in Canada, there could be no better time for Theatre Calgary to stage The Crucible. Still today, fear is used for political gain, to motivate public support for controversial measures like Bill C-51. And the public is encouraged still to watch their neighbours for suspicious behaviour – reporting them to a tip line if necessary! We may be long past claims that communists and Soviet spies have infiltrated every level of American society, but the same politics of fear continue today. Director R.H Thomson translates the urgency of Miller’s play to the stage masterfully. Thomson’s staging displays careful attention to the text. Well-paced, the theatre seems to melt away as the audience becomes absorbed in the hysteria that suffocates all reason onstage. Given the large cast of actors, Thomson does well enough keeping the action open to the audience, but some audience members may feel left out at times nonetheless. And what an outstanding set design from Cameron Porteous. Those familiar with Puritan beliefs will appreciate the encroaching forest in the background, a sign of danger in the wake of moral decay. Porteous’ set is lit beautifully by Kevin Lamotte. The town of Salem comes alive thanks to exceptional performances from both veteran and emerging actors. Truly, Sine delivers an electric performance as John Proctor. The actor’s fury and sadness as the guilt-ridden farmer resonates across the theatre, leaving the audience shaken in the play’s final moments. Stephen Hair’s Deputy-Governor Danforth is like thunder, truly a force to be reckoned with. Caught in the storm is Kelly Malcolm who plays Mary Warren, a young girl whose testimony could end Salem’s hysteria over witches. Malcolm’s warm sincerity in gesture and emotion makes her character’s journey all the more involved. Audiences will find themselves deeply frustrated with Abigail Williams who Armstrong plays with great malice. Corey’s Reverend Samuel is sure to agitate audiences, too, as he plays his character with the right sort of disgusting behaviour such an immoral, hypocritical character deserves. Such hateful characters break the Reverend John Hale, played wonderfully by Graham Mothersill, and his faith in justice. So powerful and moving is this production of The Crucible that the audience cannot wait to applaud the cast and crew. The lights are barely dim when the audience bursts into applause, quickly rising to their feet for what is a well deserved standing ovation. MIller’s The Crucible is an intense confrontation between personal desire and morality. Still relevant today, the play asks us to consider what we lose when we allow fear to rule us, and if what we lost can ever be gained back. Any opportunity to see such a timeless drama should not be missed. More specifically, any opportunity to catch Theatre Calgary’s powerful revival of The Crucible should not be missed. A must-see. 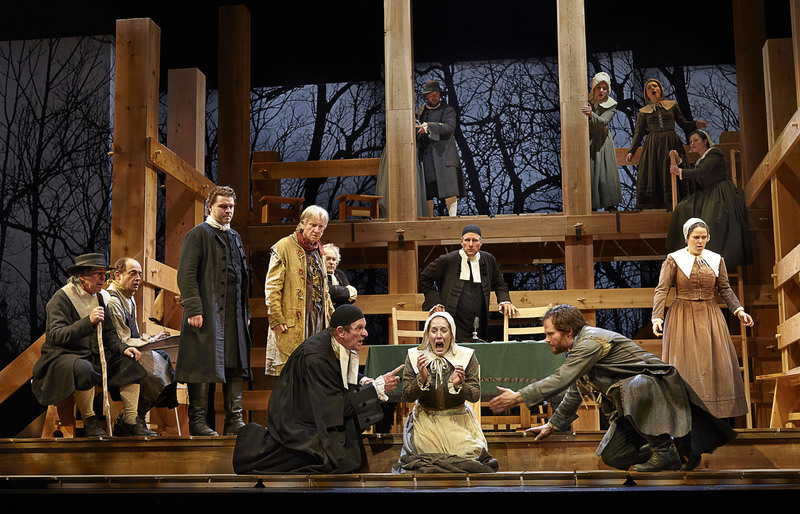 Theatre Calgary’s The Crucible runs October 13 – November 8 at the Max Bell Theatre.